Michael Link sent in this one. 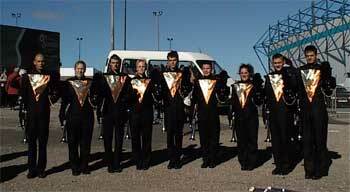 "This is a picture of the 2003 Black Knights (from England) soprano line on the day of finals. From left to right, Paul Richards, Emma Weir, Mark Dearlove, Sarah Emmett (Carolina Crown 2002), Jim Catt, James Powell, Rebecca Philips, Simon Gowin and, last but not least, Steve Muzio, our brass caption head (Cadets 2000, 2001 and 2002)." Thanks Michael!